Major John Newman Edwards, CSA, was General Jo. Shelby’s adjutant and chronicler. At war’s end Edwards chose to share Mexican exile with Shelby as well. 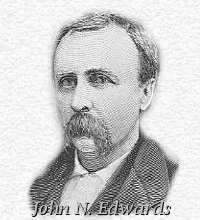 When they returned to the U.S. in 1867, Edwards rapidly published three large volumes of wartime experiences. Two dealt specifically with Shelby, “Shelby and his Men”, 1867 and “Shelby’s Expedition to Mexico”, 1872. In 1877 he published “Noted Guerrillas”, a broad handling of the Confederate irregulars in Missouri during the war. Edwards also founded the Kansas City Times and was its editor for many years. Make no mistake, Major John N. Edwards was a Confederate and proud of it. You will not find more than passing reference to the other side of the coin in his pages. His flamboyantly purple prose is sometimes entertaining and sometimes tiresome, but is always used in defense of Confederate Missouri and its view of the world and “the recent unpleasantness”. Edwards knew most of the Missouri Confederate guerrilla leaders personally, but did not actually participate in most of their raids in the same way he had as Shelby’s adjutant. So while his sources for “Noted Guerillas” are excellent, they are still mostly second-hand in that he is often reporting what he was told (sometimes months or years after the fact), and not what he saw. In addition to Major Edward’s clear partisanship, one must make allowance for the possibility that the guerillas themselves told him their stories the way they wanted them told, leaving out any inconvenient facts as they saw fit. For example, later historians have thoroughly demolished the tale given in the beginning of the book about Quantrill’s early years in Kansas before the war. However, all agree that it was Quantrill, and not Edwards, who created the fabrication. “The Making of a Confederate Guerrilla” does not –quite—constitute a defense of those who decided on this method of warfare instead of joining the regular Confederate army. Edwards clearly sympathizes with them, but in talking about why they made the choice he stays just this side of the “and they were right to do it this way” line that separates biased reporting from naked advocacy. It is the province of history to deal with results, not to condemn the phenomena which produce them. Nor has it the right to decry the instruments Providence always raises up in the midst of great catastrophes to restore the equilibrium of eternal justice. Civil war might well have made the Guerrilla, but only the excesses of civil war could have made him the untamable and unmerciful creature that history finds him. When he first went into the war he was somehow imbued with the old-fashioned belief that soldiering meant fighting and that fighting meant killing. He had his own ideas of soldiering, however, and desired nothing so much as to remain at home and meet its despoilers upon his own premises. Not naturally cruel, and adverse to invading the territory of any other people, he could not understand the patriotism of those who invaded his own territory. Patriotism, such as he was required to profess, could not spring up in the market place at the bidding of Red Leg or Jayhawker. He believed, indeed, that the patriotism of Jim Lane and Jennison was merely a highway robbery transferred from the darkness to the dawn, and he believed the truth. Neither did the Guerrilla become merciless all of a sudden. Pastoral in many cases by profession, and reared among the bashful and timid surroundings of agricultural life, he knew nothing of the tiger that was in him until death had been dashed against his eyes in numberless and brutal ways, and until the blood of his own kith and kin had been sprinkled plentifully upon things that his hands touched, and things that entered into his daily existence. And that fury of ideas also came to him slowly, which is more implacable than the fury of men, for men have heart, and opinion has none. It took him likewise some time to learn that the Jayhawker’s system of saving the Union was a system of brutal force, which bewailed not even that which it crushed; that it belied its doctrine by its tyranny; stained its arrogated right by its violence, and dishonored its vaunted struggles by its executions. But blood is as contagious as air. The fever of civil war has its delirium. When the Guerrilla awoke he was a giant! He took in, as it were, and at a single glance, all the immensity of the struggle. He saw that he was hunted and proscribed; that he had neither a flag nor a government; that the rights and the amenities of civilized warfare where not to be his; that a dog’s death was certain if he surrendered even in the extremist agony of battle; that the house which sheltered him had to be burnt; the father who succored him had to be butchered; the mother who prayed for him had to be insulted; the sister who carried food to him had to be imprisoned; the neighborhood which witnessed his combats had to be laid waste; the comrade shot down by his side had to be put to death as a wild beast—and he lifted up the black flag in self-defense and fought as became a free man and a hero. Much obloquy has been cast upon the Guerrilla organization because in its name bad men plundered the helpless, pillaged friend and foe alike, assaulted non-combatants and murdered the unresisting and the innocent. Such devil’s work was not Guerrilla work. It fitted all too well the hands of those cowards crouching in the rear of either army and courageous only where women defended what remained to themselves and their children. Desperate and remorseless as he undoubtedly was, the Guerrilla saw shining down upon his pathway a luminous patriotism, and he followed it eagerly that the might kill in the name of God and his country. The nature of his warfare made him responsible of course for many monstrous things he had no personal share in bringing about. Denied a hearing a the bar of public opinion, the bete noir of all the loyal journalists, painted blacker than ten devils, and given a countenance that was made to retain some shadow of all the death agonies he had seen, is it strange in the least that his fiendishness became omnipresent as well as omnipotent? To justify one crime on the part of a Federal soldier, five crimes more cruel still were laid at the door of the Guerrilla. His long gallop not only tired but infuriated his hunters. That savage standing at bay and dying always as a wolf dies when barked at by hounds and bludgeoned by countrymen, made his enemies fear him and hate him. Hence from all their bomb-proofs his slanderers fired silly lies at long range, and put afloat unnatural stories that hurt him only as it deepened the savage intensity of an already savage strife. Save in rare and memorable instances, the Guerrilla murdered only when fortune in open and honorable battle gave into his hands some victims who were denied that death in combat which they afterward found by ditch or lonesome roadside. Man for man, he put his life fairly on the cast of the war dice, and died when the need came as the red Indian dies, stoical and grim as a stone. As strange as it may seem, the perilous fascination of fighting under a black flag—where the wounded could have neither surgeon nor hospital, and where all that remained to the prisoners was the absolute certainty of speedy death –attracted a number of young men to the various Guerrilla bands, gently nurtured, born to higher destinies, capable of sustained exertion in any scheme or enterprise, and fit for callings high up in the scale of science or philosophy. Others came who had deadly wrongs to avenge, and these gave to all their combats that sanguinary hue which still remains a part of the Guerrilla’s legacy. Almost from the first a large majority of Quantrell’s [common misspelling of Quantrill used by Edwards throughout] original command had over them the shadow of some terrible crime. This one recalled a father murdered, this one a brother waylaid and shot, this one a house pillaged and burnt, this one a relative assassinated, this one a grievous insult while at peace at home, this one a robbery of all his earthly possessions, this one the force which compelled him to witness the brutal treatment of a mother or sister, this one was driven away from his own life a thief in the night, this one was threatened with death for opinion’s sake, this one was proscribed at the instance of some designing neighbor, this one was arrested wantonly and forced to do the degrading work of a menial; while all had more or less of wrath laid up against the day when they were to meet face to face and hand to hand those whom they had good cause to regard as the living embodiment of unnumbered wrongs. Honorable soldiers in the Confederate army –amenable to every generous impulse and exact in the performance of every manly duty –deserted even the ranks which they had adorned and became desperate Guerrillas because the home they had left had been given to the flames, or a gray-haired father shot upon his own hearth-stone. They wanted to avoid the uncertainty of regular battle and know by actual results how many died as a propitiation or a sacrifice. Every other passion became subsidiary to that of revenge. They sought personal encounters that their own handiwork might become unmistakably manifest. Those who died by other agencies than their own were not counted in the general summing up of a fight, nor were the solacements of any victory sweet to them unless they had the knowledge of being important factors in its achievement. As this class of Guerrillas increased, the warfare of the border became necessarily more cruel and unsparing. Where at first there was only killing in ordinary battle, there became to be no quarter shown. The wounded of the enemy next felt the might of this individual vengeance –acting through a community of bitter memories –and from every stricken field there began, by and by, to come up the substance of this awful bulletin: Dead such and such a number –wounded none. The war had then passed into its fever heat, and thereafter the gentle and the merciful, equally with the harsh and the revengeful, spared nothing clad in blue that could be captured.